Not long after returning from my second deployment to Bosnia I was promoted to the rank of Major and posted to CFB Wainwright. At Wainwright, the Army was standing up a new unit whose role was to conduct realistic and large scale pre-deployment exercises for units which were about to head overseas. I was posted to Wainwright as the Air Force representative with the responsibility to plan and co-ordinate all air force support and participation to these exercises. I arrived in the summer of 2005, just in time to see our first Kandahar-bound unit conduct their final preparations for deployment. As each unit would learn the hard lessons of how to fight and operate in Southern Afghanistan, our task was to collect these lessons learned, and pass them on to the next unit slated to go over. Thus, for the next two years I was fully immersed in our rapidly changing mission in Afghanistan. During this time Sheri and I were again blessed with another addition to our family, our third son Thomas. We very much enjoyed the small town atmosphere of Wainwright, the fact that I was home every night, and that were able to have a normal family life. In the fall of 2007, the Air Force was looking for two volunteers to go to Kabul to help train the newly reconstituted Afghan Air Force. It sounded like a once in a lifetime chance, so I put my name forward. Details of the mission were few. I was to be embedded in a larger United States Air Force unit, but other than that, myself and the one other Canadian pilot on the mission were going in blind . While in Kabul, I was tasked to work with the helicopter squadron portion of their small Air Force. Since the Afghans flew old Russian helicopters, I was unable to do any actual flying training with them. Considering the uncertain professionalism of their maintenance regime, this wasn’t a bad thing. All of their aircraft were leftovers from the Soviet occupation of the 80’s, and it was a regular occurrence for spare parts to be salvaged from one of the numerous wrecks which dotted the countryside. Still, there was lots of work to be done in building ground school classes and helping them to design a training regime which would allow them to quickly expand. The senior staff of the Afghan Helicopter Squadron who I worked with during my time in Kabul. On the far left and right are two of the interpreters who made my work there possible. On the far left is Saeed, who was later able to immigrate to Canada and now lives in Montreal. The 6 months in Kabul were simultaneously frustrating and an outstanding experience. It was frustrating because of the many unnecessary barriers that I encountered from both the Afghans and the American leadership. It was an outstanding experience because on a daily basis I worked with Afghan officers who had life stories that defied even the wildest of imaginations. 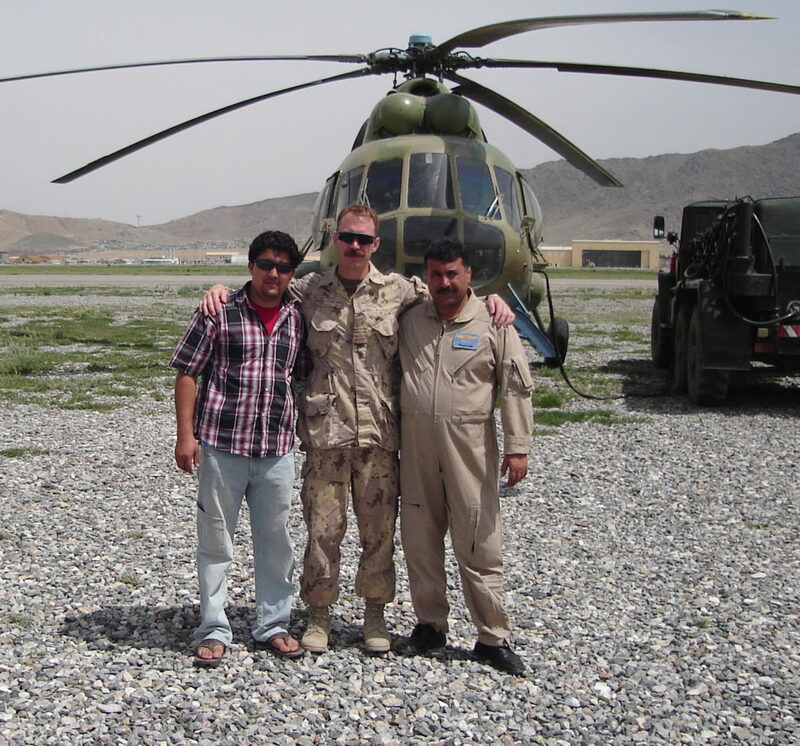 Myself, Saeed, and Habeeb, one of the Afghan pilots I worked with and got to be friends with. In the background is one of the Mi-17 helicopters which the Afghans flew. 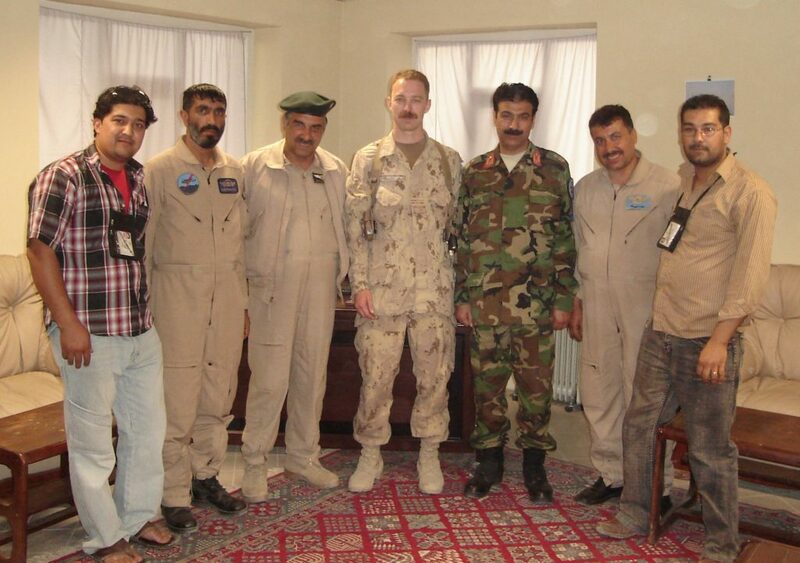 While I was in Kabul, I was informed that I was to be posted back to Edmonton upon my return to Canada. This meant that we couldn’t wait for me to finish in Kabul before starting to prepare our house and family for the move. During an overseas deployment, you generally receive two weeks of holidays mid-tour to fly home and take some vacation with your family. When Sheri and I were both in Bosnia on my first deployment, we took this time to tour Europe. For my second deployment in Bosnia, I came home and we went camping and generally relaxed. Not this time. The two weeks were spent painting, organizing and generally getting the house ready to be put up for sale. At the end of the two weeks, I went back to Kabul leaving Sheri to keep the house ready for showing. With three boys under the age of six, this was no small feat, but she was able to successfully get the house sold. A couple weeks after I returned from Kabul, we went house shopping in St Albert. After a couple of days of looking, we settled on a house that was in a location and neighborhood which we quite liked. A few months later in the summer of 2008 we moved to St Albert.